The next meeting of the Society takes place on Thursday 8th March at 7:30 pm in St. Andrew’s Church, Bilston Street, Sedgley. The speaker is Keith Hodgkins vice chairman of Tipton Civic Society and a passionate Black Country heritage campaigner. Keith’s PowerPoint presentation traces the evolution of the main lines and branches with vintage images recalling the days when the region’s industries were well served with a network bringing in raw materials and leaving with products as diverse as steel bars and sausages. The evening is sure to delight all train users and everyone interested in the scenery of the highways and byways of track travel. As usual visitors are invited to come along. Individual talks cost £1. March talk sponsored by Sedgley Estate Agents Roden Boydell. Once again the mother and son team of Beryl and John Wilkes, have produced a cracking collection of photographs featuring the old Coseley Urban District. The calendar first appeared in 2000 and has only missed one year, 2010. All are now highly prized. The 2012 edition is available locally (£3.50) or by post (add £1.50 for p&p). For further details please email Coseley Calendar 2012. While this is an easily named building in Sedgley, the problem is sorting out its early history. We suggested you visited Vicar Street and gave the exterior a second look – we think the brickwork, windows and foundations might tell an intriguing tale. 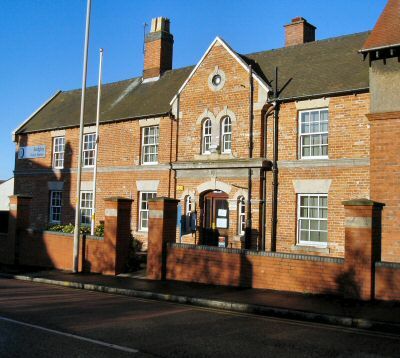 This 1860s Victorian police station was built on the site of Sedgley’s first workhouse. The workhouse was built in 1734 to house 60 inmates and replaced in 1855/6 with one catering for over 800 on the west side of Burton Road, Upper Gornal. Eventually the Sedgley building was closed in 1858, sold on to the police in July 1859 and its contents auctioned in August. On-going research by Michelle and Carl Higgs and Christine Buckley has raised the intriguing prospect of identifying parts of the present day station to the reign of George II. The façade’s brickwork was revealed a few years ago looking more C18th than C19th. It’s a tale of two buildings and deserves to be told. The land surrounding the hall has undergone many changes in the last 250 years. 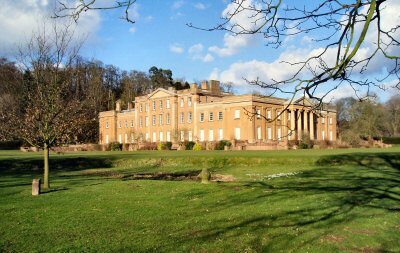 In 1764 St. Michael & All Angels was built to replace an older church and complete the repositioned Himley village. The next decade Lancelot “Capability” Brown was commissioned to landscape the parkland. He designed the lake and supervised the tree planting to create his trademark ‘natural’ look to set off the mansion in the best possible way. The hall was now approached from the west through a grand tree lined carriageway. The Viscounts and Brown had allowed nothing to get in the way of their master plans. It is this 180 acres of attractive ‘countryside’ that now draws thousands of visitors. The winter months promise frosty mornings, snow under foot and Christmas card scenes guaranteed to get those cameras clicking away. You can take a woodland walk to see the ponds and waterfalls that feed the lake and visit the dog cemetery and ice house. Take time to discover the ha ha and Edward VII’s tree as you treat yourself to a relaxing stroll taking in views of the Grade II listed hall. Enjoy the festive season and early weeks of 2012 whatever the weather.